Pesticides are chemical compounds used to kill, repel, or control unwanted plants, animals, and microorganisms (i.e. those considered to be weeds, pests and diseases). Pesticides such as herbicides, insecticides, fungicides, antimicrobials and disinfectants are used routinely on agricultural products, including food and animal feed, to maximize crop output and protect produce during storage and transportation. Through the consumption of such products in their diet, people are hence exposed to low levels of pesticides. In order to protect consumers, pesticide residues are under strict legislation worldwide. The maximum residue level (MRL) is the highest amount of an individual pesticide residue that is permitted to be present in or on food or animal feed. MRLs vary from region to region across the world and food manufacturers exporting produce to other countries have to meet all the individual MRLs in each target region. The process for analysing pesticide residues typically involves extracting the residues, clean-up procedures to remove other components, and an analytical procedure to identify and measure the amount of pesticide residue. Pesticide residue analysis using these techniques enables individual pesticides in the sample to be identified and quantified when compared against a matrix of known pesticides. For best results, the method requires reproducible conditions and the use of high quality reference standards. Analysis of pesticide residues is a highly sensitive procedure requiring extremely accurate solutions. Accurate weighing and dosing of reference standards, as well as dilution with solvents, is therefore critical. With the inherent errors associated with both pipetting and volumetric glassware, preparing solutions gravimetrically offers an increased level of accuracy. Individual stock standard solutions typically are prepared in a concentration of 1 mg/mL. The required amount of pure pesticide reference standard (typically 10 – 50 mg) should be weighed out using a 4- or 5-decimal place balance or scale, depending on the method. Transfer to an appropriate volumetric flask, dissolve in a suitable solvent, and make up to the required volume to achieve the desired concentration. Label the flask with all relevant information. Liquid reference standards can be dispensed, by weight, directly into the solvent. It is also possible to purchase ready-made stock standard solutions of pesticide reference standards, if they are certified by the manufacturer or by an independent source. Working standard solutions typically have very low concentrations in a range of 0.005 – 0.01 µg/mL. To achieve such low concentrations, it may be necessary to create intermediate solutions and dilute further to achieve the required concentration. For a multi-residue method, several pesticide standards are mixed. Combine appropriate quantities of the individual stock standard solutions to create the required concentrations to compare against the sample under investigation. 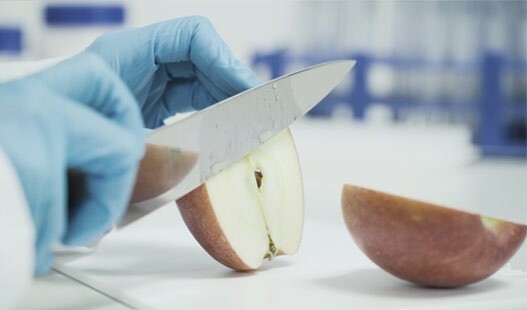 Preparation of samples for pesticide residue analysis is a complex procedure and is dependent upon the sample type, the pesticides under investigation and risk of cross-contamination. In a complex sample matrix, it is necessary to remove unwanted interferences in order to focus on the pesticide content. Common extraction preparation techniques for pesticide residue analysis are QuEChERS (Quick, Easy, Cheap, Effective, Rugged and Safe) and Automated Solvent Extraction (ASE). Samples are typically analysed using gas chromatography (GC) or high performance liquid chromatography (HPLC) in conjunction with mass spectrometry (MS) for identification and quantification of the pesticides present. The extracted samples are introduced into the analyser in accordance with the manufacturer's instructions. The results from the sample are compared to those from the working standard solution to identify and quantify the pesticides in the sample. This is typically done automatically by the analyser, delivering results in mg/kg. To comply with pesticide limit regulations, the amount of each residue must not exceed the respective MRL of the target market. Results must be documented fully to ensure traceability. Over 1000 pesticides are currently registered worldwide. Pesticides are heavily regulated. However regulations and MRLs (Maximum Residue Levels) differ from region to region across the world. In the US, the Environmental protection Agency (EPA) is responsible for setting MRLs (also referred to as 'tolerances'). In the EU, the European Commission (EC) defines MRLs. Each individual MRL is the upper allowable limit for the specified pesticide on or in a food product which is deemed safe for consumer consumption. Such levels are set following rigorous risk assessments. In the US and EU, all laboratories carrying out official testing of pesticide residues must be accredited to ISO/IEC 17025 which sets out the general requirements for the competence of testing and calibration laboratories. Guidance documents also place a focus on the preparation, and management of pesticide standards, stock solutions and working solutions (calibration solutions). In the preparation of stock standard solutions, it is specified that not less than 10 mg of the reference standard should be weighed out using a 5 decimal place balance (EU guidance document SANTE/11813/2017). The two largest sources of errors in the laboratory come from standard solution processing and human operations. With the amount of laboratory time spent processing standard solutions estimated to be greater than 60%, measures which can reduce the incidence of such errors can significantly improve overall accuracy and laboratory productivity. Traditional standard solution preparation involves the use of volumetric glassware. Whilst instrumentation and software have provided dramatic improvements in analysis and data processing, the manufacturing process for volumetric flasks with accuracies similar to those in use today has remained unchanged for decades. The traditional volumetric method is time consuming and prone to error at many points in the process. Volumetric standard solution preparation is highly manual, subjective, and variable. It is universally accepted that a gravimetric measurement is intrinsically more accurate that a volumetric measurement. In fact, pipettes and volumetric measuring equipment are calibrated using gravimetric methods. In a fully gravimetric system, the user defines the concentration required and the target amount of solution. The system software calculates the target amount of solid to dispense and then, according to the actual amount of solid dispensed, delivers the appropriate amount of diluent to prepare an extremely accurate and precise concentration. In a liquid dispensing system, the software calculates the required amount of diluent according to the actual amount of solid dosed manually; the result is still a highly accurate concentration. Implementing a gravimetric sample preparation system reduces laboratory errors and Out-of-Specification (OOS) incidents by up to 50 percent, while simultaneously increasing laboratory efficiency and reducing waste. Gravimetric standard solution preparation eliminates subjectivity and variability. Pesticide residue analysis requires highly accurate calibration standard solutions to identify and quantify the pesticides present in a sample. This requires preparation and dilution of stock solutions, the accuracy of which can be increased significantly by using gravimetric methods instead of volumetric. If you need further information or any support on gravimetric standard preparation, our team of experts is here to help. Please do not hesitate to contact us. Laboratories performing pesticide residue analyses often test routinely for over 100 different pesticides. Preparation of both stock solutions and working solutions must be done with care, making the process time and labour-intensive. The pesticide reference solutions are often made in bulk and stored for future use. However, the standards must have a high stability as the pesticides can degrade over time depending on the solvent, length of storage, temperature, light and the presence of contaminants (including traces of water). For low or non-stable pesticides, the reference standards must be made fresh each time, adding to the workload of the analyst. Reference standards must be accurately weighed and the balance used must meet the accuracy requirements of the analytical process. The purity of the reference standard, in conjunction with the actual dosed weight, must be used to determine the precise concentration of the solution. Therefore, not only is the accuracy of each weighing critical, but also the amount of calculations required to determine the purity of each component adds to the complexity of the analysis. Traceability is important for safety and audit purposes. Should any problems arise, having traceable results enables the source of the fault to be identified and rectified. Each weight result, calculation and dilution step must be meticulously documented to ensure traceability. Typically, results are written into a lab journal and then manually entered into a spreadsheet for analysis. Comprehensive labelling of reference stock solutions, working solutions and samples is vital. Such manual documentation procedures have a high risk of human error and place a huge burden on analysts. Laboratories must also provide a report of the analysis to their customers. 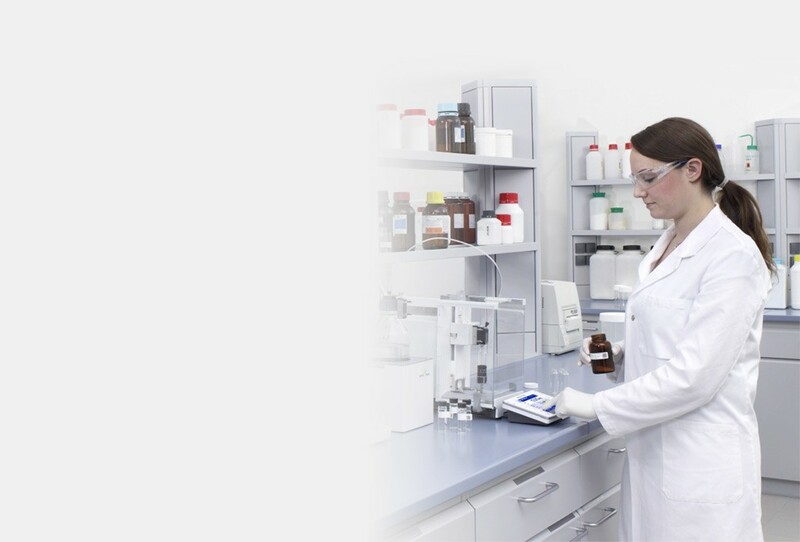 A METTLER TOLEDO Excellence level analytical balance with an automated gravimetric liquid dosing module enables you to prepare highly accurate standard solutions. For a full workflow solution, combine with LabX software and benefit from comprehensive data handling and sample tracking functionalities. 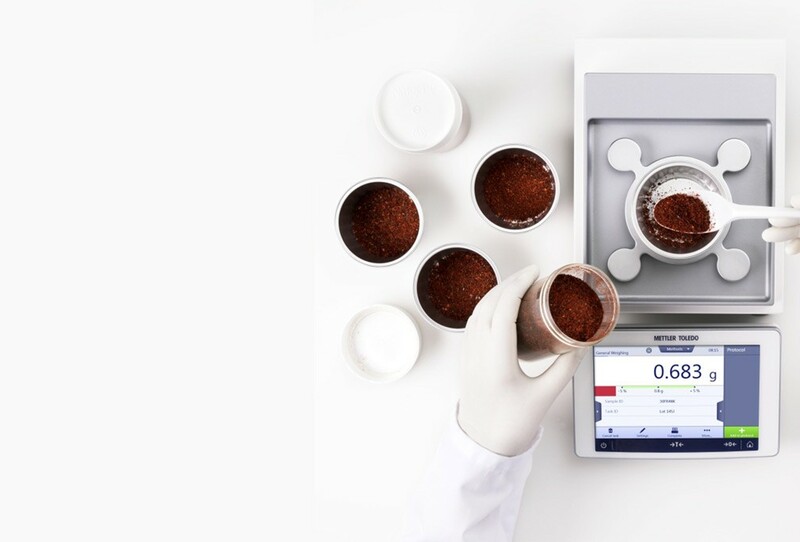 Gravimetric standard preparation involves weighing not only the solid substance but also the solvent, enabling specific concentrations to be prepared accurately and precisely. Preparing solutions gravimetrically requires only one container – weighing paper, weighing boats, intermediate tare containers and volumetric glassware are no longer needed. The actual weight recorded by the balance is used to calculate the precise amount of solvent required to reach the target concentration. Gravimetric standard and sample preparation thereby eliminates major sources of error in the standard preparation process, reduces the labour requirement, and minimizes variability. The required amount of reference standard can be dosed directly into the target container (e.g. Chromatography vial). The calculated precise amount of solvent is dispensed automatically into the target container. Small quantities of solutions can be prepared so less material is required, saving costs, reducing waste and minimizing the impact of disposal on the environment. Connecting the automated liquid dosing system to LabX laboratory software offers a full workflow solution. 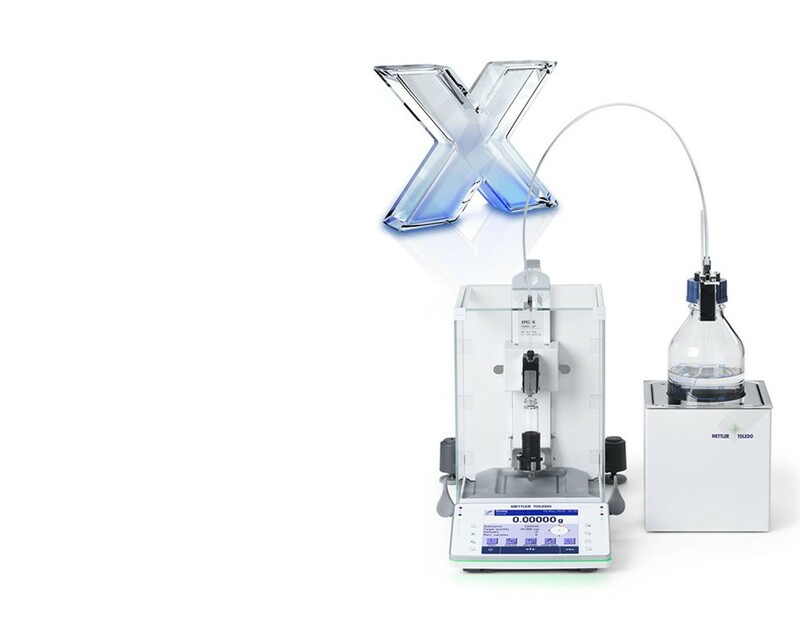 LabX provides step-by-step SOP instructions on the balance display. Each step must be confirmed by the operator, ensuring SOPs are followed precisely by everyone. All data is handled automatically by LabX and saved in a secure, centralized database to ensure full traceability. When the analyst enters the ID of the reference standard, LabX automatically can retrieve the purity from the reference standard spreadsheet. Based on the purity and the actual amount dosed, the correct amount of solvent is automatically added to the standard to create the desired concentration. Labels can be customized to include user ID, sample ID, actual concentration, production date and expiration date. Connecting a barcode reader allows sample and reference standard IDs to be read in electronically. With the addition of a printer, labels can be printed automatically. Import/export options allow bi-directional transfer of data between existing networks, data archives, LIMS, ERP and other knowledge-management systems. Manual documentation is no longer necessary, eliminating transcription errors entirely. Watch the video and learn how dosing liquids gravimetrically in a semi-automated process increases the accuracy of your reference standards. In combination with a barcode reader, a printer and LabX, you can eliminate manual transcription, have all calculations performed automatically, ensure traceability, and dramatically reduce the time and effort required to create accurate reference standard solutions for pesticide residue analysis. With more than half of analysts' time in the lab spent on standard preparation, read the science behind why you should make the switch from volumetric to gravimetric preparation. Create accurate concentrations every time! This white paper describes the benefits of gravimetric sample preparation and includes a direct comparison with the traditional volumetric approach. Before the pesticide residue analysis, the food sample needs to be prepared by different processes depending on types of sample. Food samples may need to be homogenized and reduced to a smaller particle size. After the homogenization, the food sample are weighed and extracted with suitable solvent. Good analytical results always start with a good weighing process; weighing is the first step in virtually any analytical procedure. METTLER TOLEDO Excellence level precision balances deliver fast and accurate results and are perfect for preparing samples for pesticide residue analysis. The innovative SmartPan™ weighing pan minimizes the effects of air currents on the weighing cell so that you get your results up to twice as fast compared to a standard weighing pan. The extraordinary stability provided by SmartPan enables even 1 mg balances to be used without a draft shield in standard conditions. Without the need to keep opening and closing draft shield doors, the number of process steps is dramatically reduced, making processes much faster and more ergonomic. With the optional ErgoStand, the balance terminal can be placed at eye level to avoid excessive bending of the neck during long period in front of the balance. The tray underneath the SmartPan catches any spills, and both simply lift off for easy cleaning. With overload protection and resistance to harsh chemicals, these tough balances will provide you with years of reliable service. Connect your Excellence level balance to LabX software and benefit further from SOP user guidance on the balance, automatic documentation and calculations, full traceability, data integrity, and centralized control of users, tasks and instruments. What's the best way to keep track of all my standards, solvents and samples? It's crucial to ensure that all standards, solvents and samples are correctly labelled. Printing labels is more efficient than writing labels by hand and avoids transcription errors. Using barcodes on labels speeds up the process even more and further reduces the risk of human error. METTLER TOLEDO balances have different connection ports to make it quick and easy to add both a printer and a barcode reader. 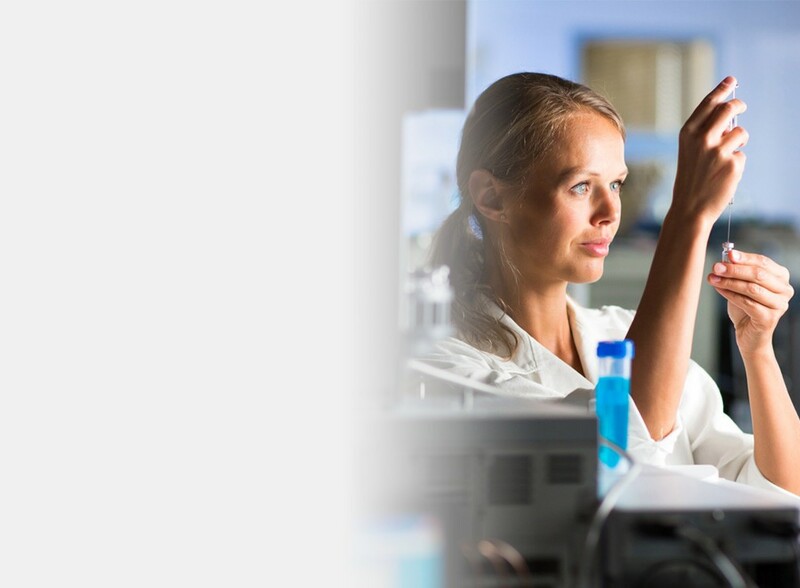 LabX laboratory software can greatly simplify sample and data handling processes. Barcodes from standards, solvents and user IDs can be read-in via barcodes. LabX prints barcoded sample labels automatically. The sample IDs are read in via the barcode and the weight result is automatically stored securely with the ID and all relevant metadata. Samples are fully traceable. 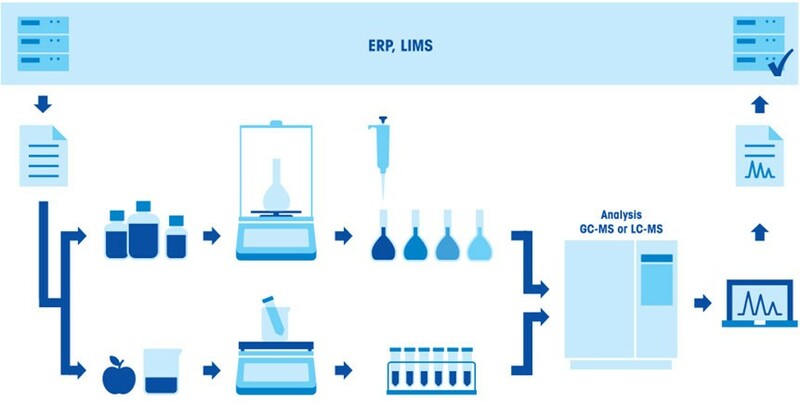 LabX can transfer the data to other LIMS/ERP systems as required. I work with many different pesticide reference standards and different batches sometimes have different purities. How can I make sure the correct purity is used when calculating the concentration of my stock solutions? Typically, when a company takes delivery of their reference standards, all relevant data, including purity, is saved in a database of the standards. LabX uses the relevant data from the database; this can be done automatically by scanning the barcode on the container of the standard. When the balance has the automated liquid dispensing system installed, LabX uses the purity from the database and the actual weight of standard dosed to dispense the precise amount of solvent automatically to create the desired concentration. In this way, it is not critical to weigh the standard exactly as LabX adjusts the amount of solvent accordingly, and the concentration of the resulting solution will be as desired. We are testing tobacco for pesticide residues. Are there any recommendation regarding weighing standards and samples for this application? There are several guidelines on general procedure. The European Union document SANTE/11813/2017 [Ref. 12.1] sets out best practices for the general quality control procedures for pesticide residue analysis in foodstuffs. For tobacco, the Cooperation Centre for Scientific Research Relative to Tobacco (CORESTA) Guide No. 5 provides a technical guideline for Pesticide Residues Analysis on Tobacco & Tobacco Products. Regarding weighing and preparing stock standards, stocks standards should be prepared with not less than 10 mg ‘pure’ standard material using a 5 decimal place analytical balance. We are a small/medium sized testing lab carrying out pesticide residue testing and must comply with ISO/IEC 17025 to ensure our continued accreditation. How can you help ensure our weighing processes meet the regulations? Based on METTLER TOLEDO's globally accepted Good Weighing Practice™, this free service helps you make sure you have the right balance to meet the needs of your weighing processes. Through a thorough risk-based analysis of your applications, we can provide you with an optimum balance calibration and routine testing schedule, including which tests to carry out when and the recommended test weights. With the optimized testing schedule, you can avoid over-testing your balances and potentially make considerable time and cost savings. METTLER TOLEDO's Excellence Level balances have built-in quality assurance functionalities so you can be sure that the results generated are always valid. Intelligent functions, such as StatusLight™, LevelControl and GWP Approved, help ensure right-first-time results by actively monitoring that all relevant conditions for correct weighing are met. Automated dispensing with Excellence level analytical balances enables you to achieve a level of dosing accuracy unmatched in a manual process. Dilution with automated dispensing avoids the need for pipetting and eliminates the errors associated with pipetting processes. The increased level of accuracy, reduces the balance's minimum weight and enables you to use less substances. Considerable materials savings can therefore also be made. LabX provides step-by-step instructions on the balance display and ensures all analysts follow SOPs. All data and calculations are handled automatically by LabX – transcription and calculation errors are eliminated entirely. Data is saved securely in a centralized database, providing full traceability and audit-proof documentation. Which balance do I need to use to get accurate standard solutions? Every measurement on ANY balance is subject to uncertainty. Understanding uncertainty is key to ensuring accurate weighing results. It is not the readability that determines the accuracy of a weighing instrument, but rather its repeatability. When weighing out very small quantities, the balance's minimum net sample weight capability is also of critical importance. The minimum weight value is determined by a service technician at the balance's place of operation and is unique to every balance and its working environment. Weight values below the minimum weight value cannot be trusted to be accurate. According to the criticality of the application, a safety factor is usually applied to the minimum weight value to ensure that weighing always take place in the safe weighing range of the balance. The lower boundary of the safe weighing range is determined by using the minimum weight and the required process accuracy. Download Guide "Safe Weighing Range - Ensures Accurate Results"
METTLER TOLEDO's global weighing standard GWP® helps you choose the right balance to meet your application requirements. Ask your local representative for a free GWP® Recommendation to choose the right balance for your application and to discover if your existing balance is fit for purpose. I have to prepare many different standards on a daily basis. It's time-consuming and takes a lot of effort. How can I be more efficient without compromising accuracy? By making the switch to gravimetric sample preparation you can actually increase the accuracy of your solutions. The amount of solvent required is calculated according to the actual amount of substance dosed to deliver a highly accurate concentration. Gravimetric sample preparation is also considerably faster than volumetric methods; one testing lab reduced their bi-monthly preparation of stock solutions from 2 weeks to 2½ days. Smaller quantities can be made so you use significantly less substance and solvent, saving costs, reducing waste, and minimizing the impact of disposal on the environment. Dilution with automated dispensing avoids the need for pipetting and eliminates the errors associated with pipetting processes. If using volumetric methods, consider attaching a printer and barcode reader to your balance. Using barcodes to identify your reference standards, solvents and samples saves time and avoids errors. Printing sample labels and reports saves time and avoids transcription errors. Preparing reference standards and dilution samples for pesticide residue testing generates so much data and paperwork, and it all has to be transferred to the database in our LIMS/ERP system. How can we do this in a faster and more efficient way? LabX laboratory software can handle all of your pesticide residue analysis data and calculations for you automatically. Data is saved securely in a centralized database and can be transferred to your internal data management system as required.